Fried chicken and Louisiana are practically synonymous. This classic Southern staple can be found in abundance here. With expert chefs preparing traditional deep-fried or pan-fried crispy chicken, your mouth is going to be watering just reading through this! Whatever kind you prefer, here are the 10 best places for fried chicken in Louisiana. Triplet Blue Stores are where the hipsters go for delicious down home cooking. 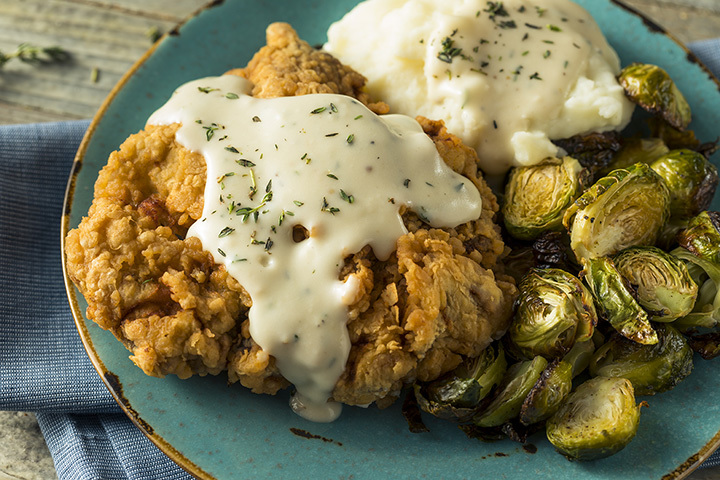 We’re talking Southern cooking with Louisiana flavor like crispy and spicy fried chicken. Some people go back several times a week for that perfectly seasoned chicken and sides. Make sure you have cash, though, since they don’t accept credit cards. Awesome food at Linda’s Chicken & Fish in Denham Springs, but it’s worth the wait if you get there when they’re busy. Just wait until you taste the best fried catfish and chicken livers in the area. Maybe even the state. But don’t tell anyone. We want this place to ourselves. Gonzales, Louisiana has fast becoming the fried chicken capitol of the South, thanks to Leader’s Fried Chicken. Daily and weekly specials on chicken, fish and all the fixings. And don’t forget to get their world famous sauce to dip your chicken in. Or your fingers. It’s all good at Jeanie’s in Hammond, Louisiana. And you haven’t had good food until you eat here, especially if you’re craving a Southern style meal. People rave about the pork chops and fried chicken, and you get daily lunch specials that include your main course, two sides, a roll, and dessert for under $10. Louisiana Fried Chicken is one of the unusual fast food places that doesn’t have the feel of a chain restaurant. The secret is in the special zesty Cajun batter used to deep fry the chicken in. It may not be the fanciest place in town, but looks aren’t everything. If you like chicken livers, give the ones here a try, too. You might be surprised to know that one of the best crawfish places around also makes great fried chicken. That’s so at Crawdaddy’s Kitchen in Shreveport. Apparently, there’s something going on in the kitchen because this little diner puts out tasty food without apology. They also have frog legs, alligator, and crab. Better leave room for the peach cobbler, though. If your mama made chicken like this, why did you ever leave home? And if your mama never made chicken like this, you owe it to yourself to stop and sample the tasty treat. There’s nothing better to fill an empty stomach. Look for the big yellow and red chicken. This place is amazing. You can show up by yourself or with 35 other people and get the same quality, service, and great food. Tom’s Fried Chicken in Ville Platte is the perfect place to grab some grub. If you’re not there for the chicken, try the Swamp Burger. Just ask and they’ll tell you about it. Jenny’s Fried Chicken has more than just great shrimp po’boys. You can enjoy a great platter of perfectly fried chicken with your favorite sides and listen to inspiring gospel music at the same time. And if you love hot peppers, they sell Cajun Chef hot jalapeno peppers made in Louisiana. Go on and get your grub on at Jenny’s. When you enter this quirky and colorful diner, you’ll be greeted with southern hospitality and treated to one of the best dining experiences in New Orleans. Want fried chicken and roasted rabbit? No problem. Got a taste for spicy boudin balls? They got them, too. How about shrimp and alligator sausage cheesecake? Believe it or not, that’s there, too. Better come early because a two-hour line can form quickly. Yep, it’s that good.